Have you ever went out to eat and had a dish that just stuck with you. This dish is that one for me. 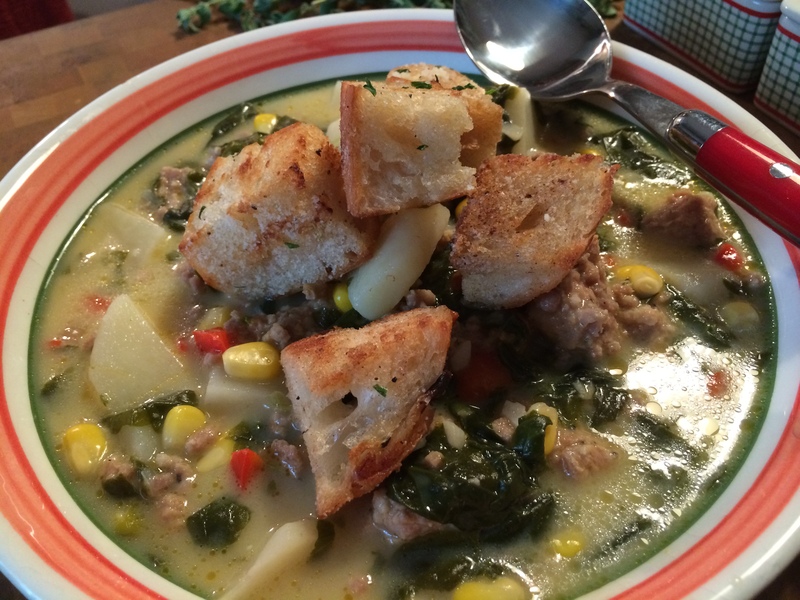 It’s a soup with spicy Italian sausage, potatoes, and creamy broth. Can I just tell you, I loved it and had to recreate it. I did change a couple of things to make it my own, and now Steve and I have it all the time. 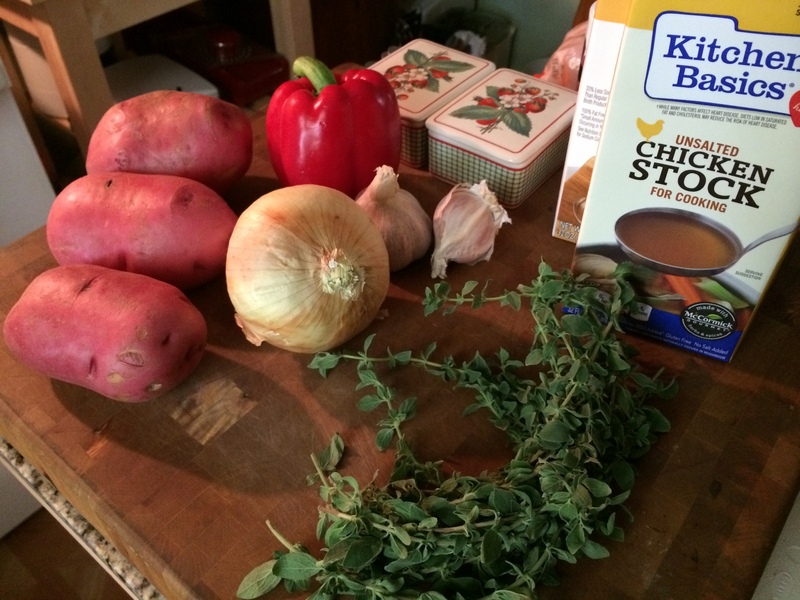 So let’s start with some of the ingredients for this amazing soup. I grabbed some fresh oregano from my garden and underneath all of that is some fresh rosemary too. Ok, so the potatoes first. 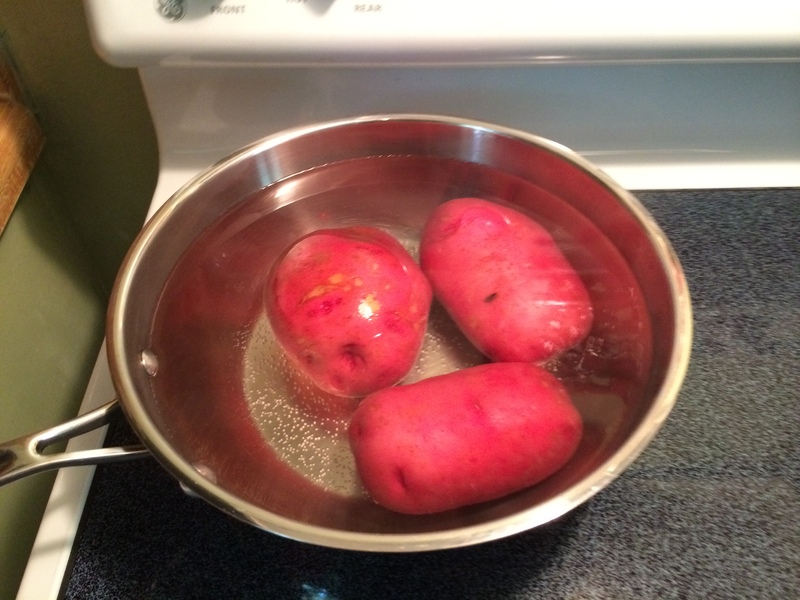 I boiled 3 large red potatoes first so they would be easy to peel. After the potatoes cooked, I drained them and set them aside to cool so I could peel and chop them into a large dice. 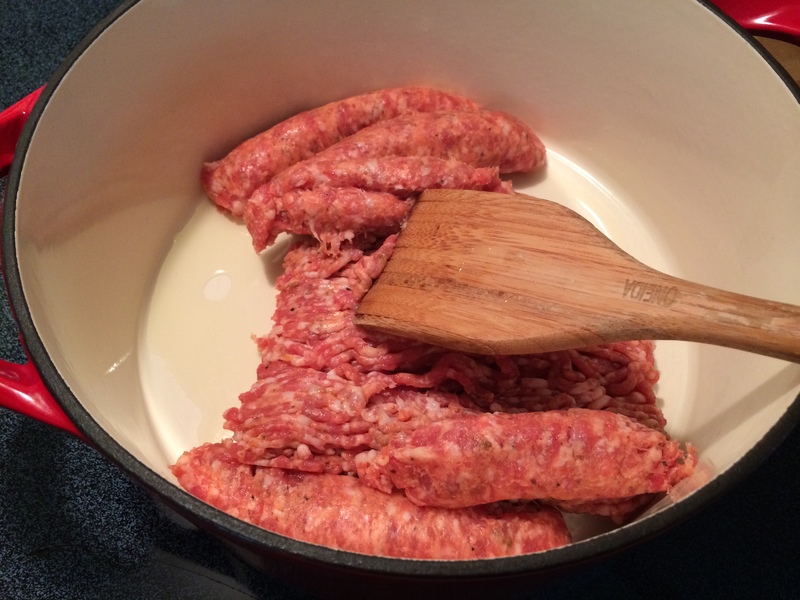 Next I browned off 2 pounds of spicy Italian sausage in a heavy bottom pot. While the sausage is browning off and getting some nice color on it. This is the time to prep the raw veggies. 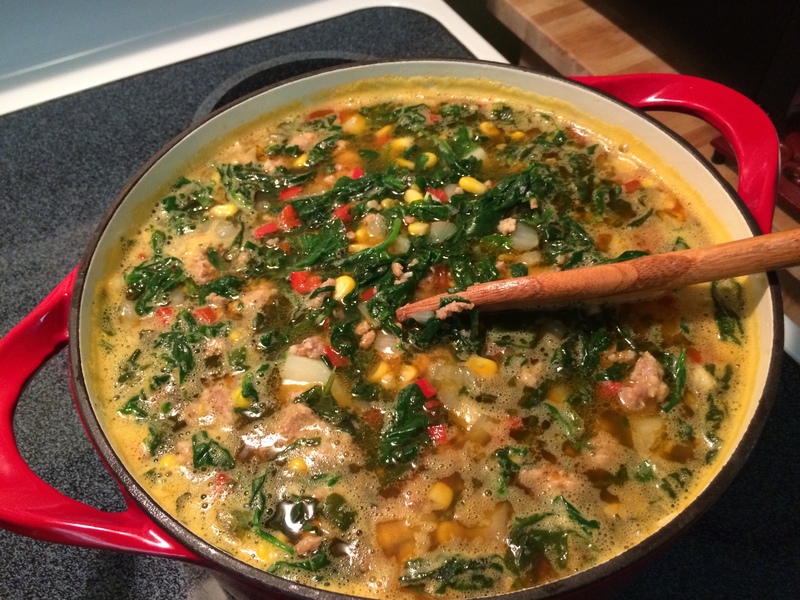 Now This dish also uses corn and spinach. Both of these I have thawed and drained the excess liquid from the spinach. Now the original dish used kale both work great, I just happened to have spinach in my freezer. I’ve diced all the veggies up. 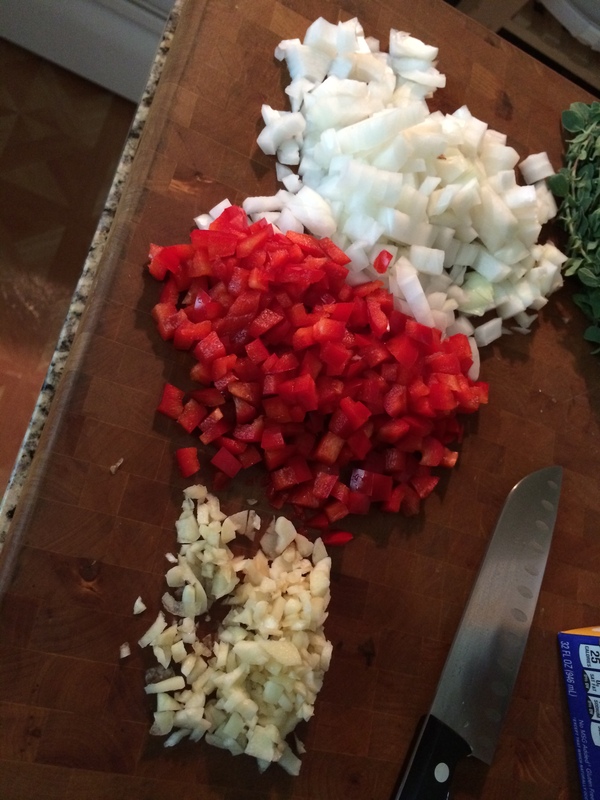 One large white onion, 1 red bell pepper, and 3 cloves of garlic. 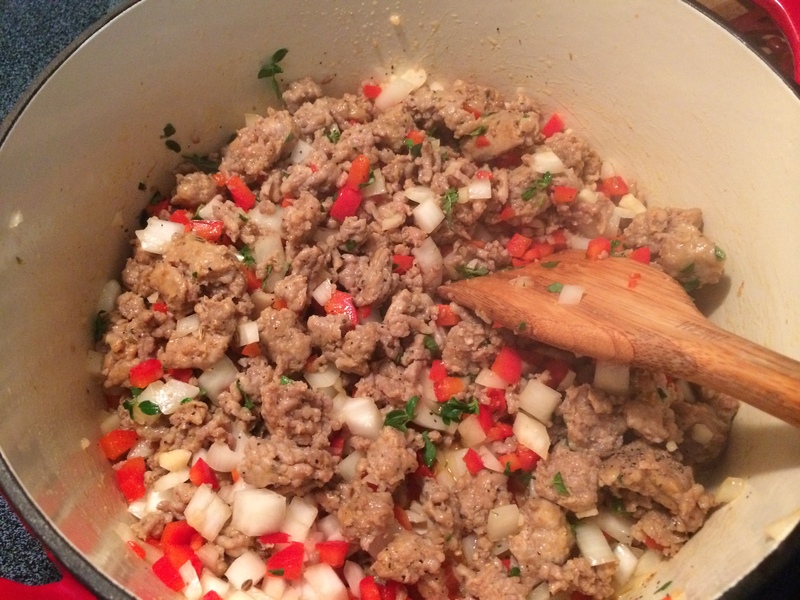 At this point the sausage is nice and brown so I just toss in all the veggies. 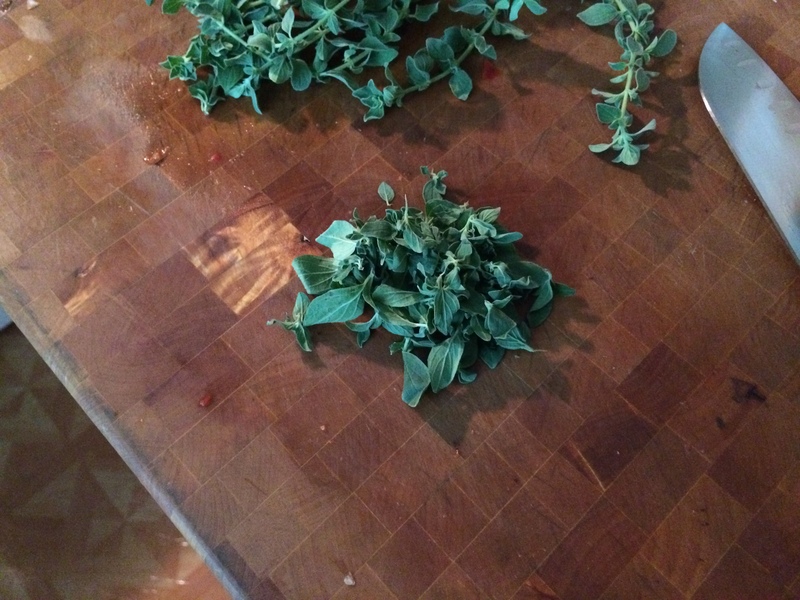 After the veggies have softened, about 5 minutes or so, I start chopping up my oregano, and rosemary. 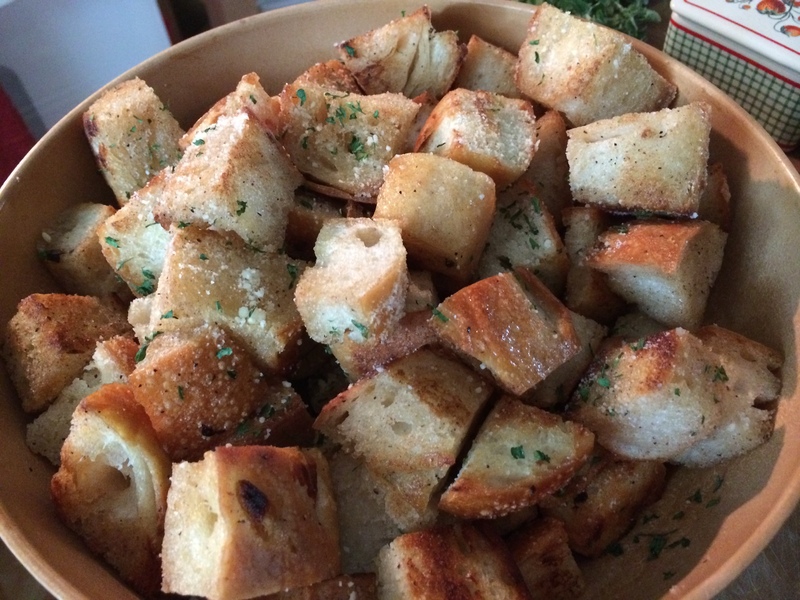 I used 2 tablespoons of the oregano, and 1 tablespoon of fresh rosemary, and tossed those right in. Moving along, I added 6 cups of low sodium chicken stock to the pot. I then added 3/4 of the package of frozen corn to the pot. I don’t add the spinach until last so it keeps it beautiful green color. 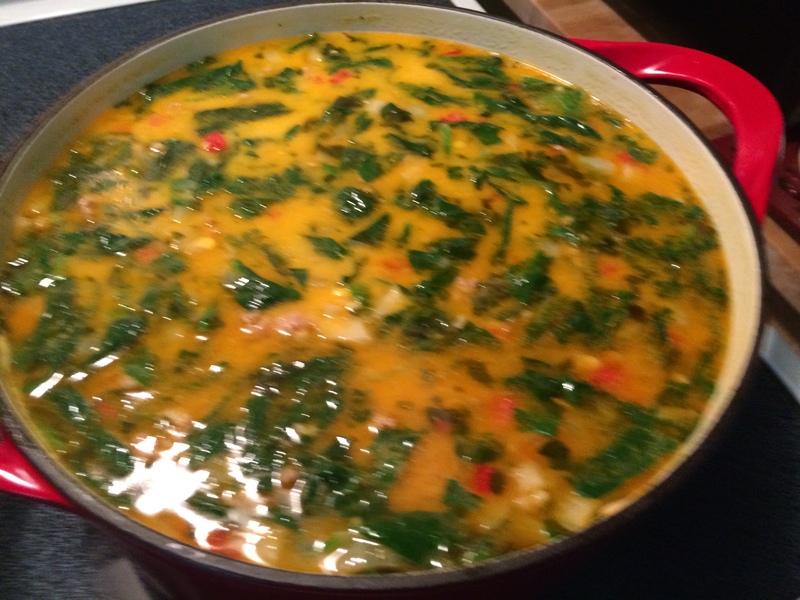 I let this simmer for 20-30 minutes before adding in the spinach. 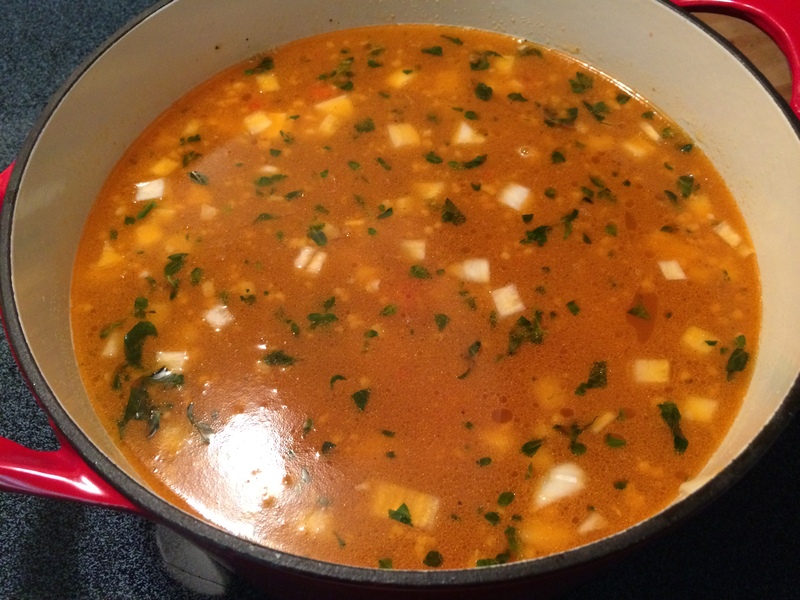 Now I throw in the diced potatoes that I cooked earlier and let this simmer for just a couple of more minutes. 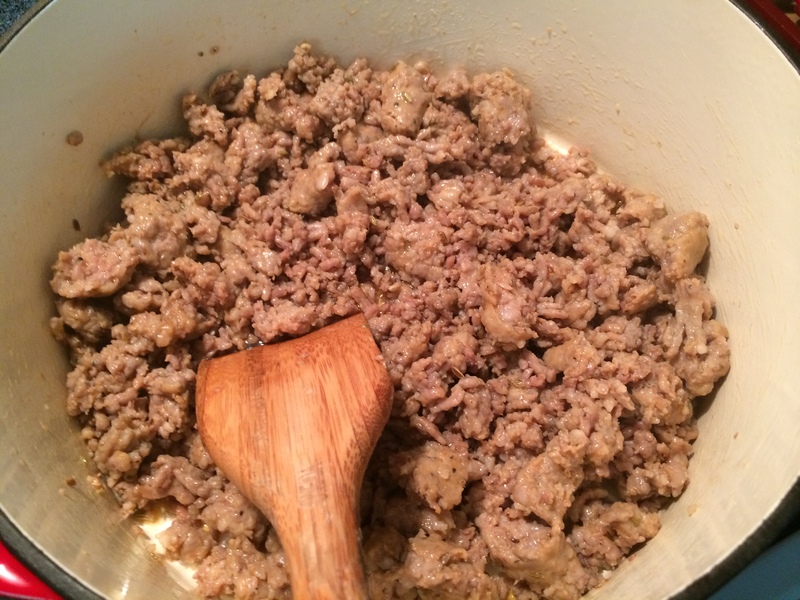 Then I skim off any extra fat that may have accumulated from the sausage of the top of the soup, before adding 1 cup of heavy cream. 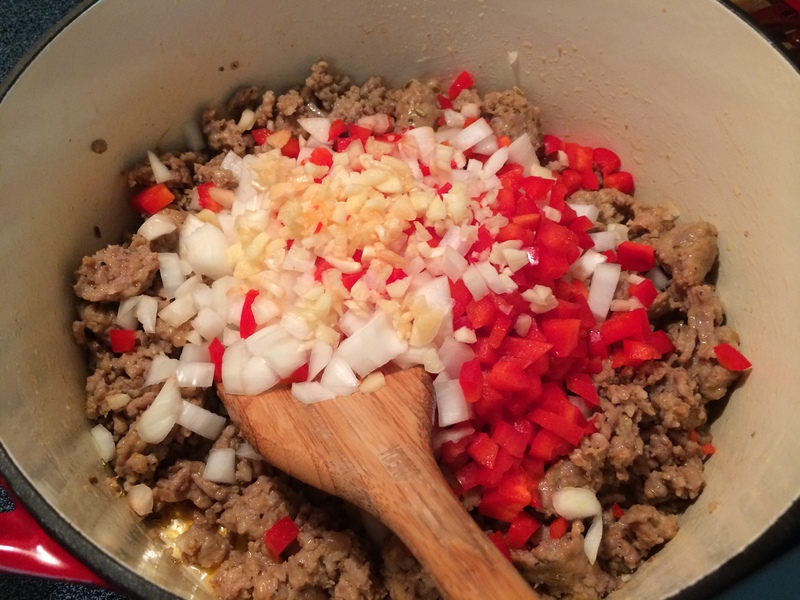 Remember this makes a big pot of this soup. 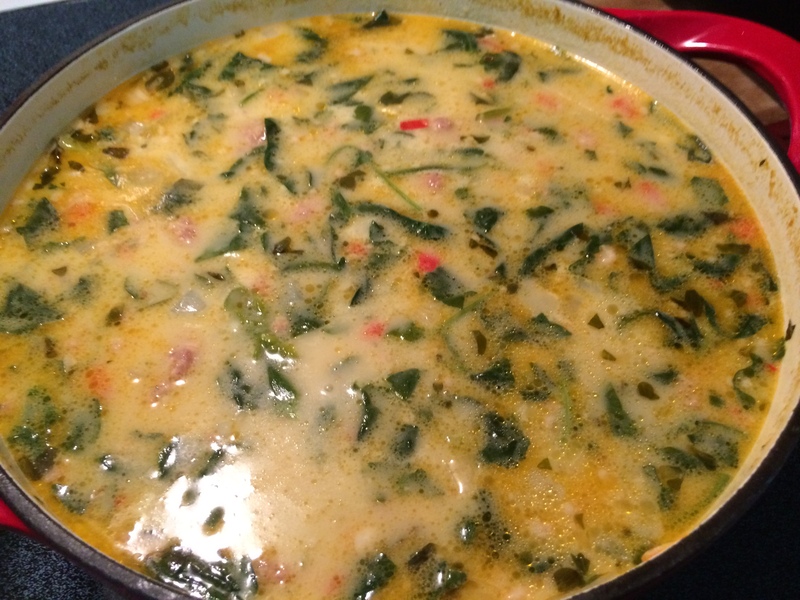 Between the starch of the potatoes and the heavy cream, both will thicken the soup nicely. However; if you like your soup to really be thick, just add 1 heaping tablespoon of corn starch to 1 tablespoon of cold water and make a slurry, and just to add this to the soup and bring it back up to temperature and it will thicken even more. l previously made made some of my homemade garlic Ciabatta croutons with Parmesan cheese to go on top of this delicious soup.